Watch the moments you record come alive on quality digital video when you record using the DV-MPRL Digital Video Cassette. 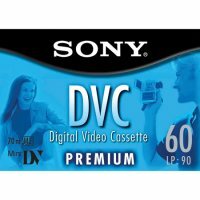 Providing 60 and 80 minutes of Premium quality digital video, this Mini Digital Video Tape, features Metal evaporated tape, and a Diamond-Like Carbon coating protective layer, which improves durability and helps prevent shedding and drop out. *Diamond-Like Carbon protective layer improves durability and helps prevent shedding and drop outs.